You are here: Home / Weekly Columns / Opinion / Apple AirPower Mat: Why Critics Need to Start Evaluating Tech Differently. Apple AirPower Mat: Why Critics Need to Start Evaluating Tech Differently. (ThyBlackMan.com) Apple didn’t talk about AirPower Mat during its September 2018 event people are slipping into madness. They are criticizing Apple for not talking about a product the company never said it was going to talk about. While the critics are vocal, Apple has rubbed salt in the wound by removing the mentions of AirPower Mat from the company’s official website. People need to understand that Apple never said that they will unveil AirPower Mat during the said event. And more than that, they need to understand that making that Mat is not as easy as it seems. Last year when Apple launched the iPhone X, the company said it is working on a wireless charging solution called AirPower Mat. The charging pad allows users to charge their Apple devices such as the new iPhone models, Apple Watch, and AirPods. Apple said that the product will be available at some point in 2018, but they never mentioned a date for the same. At the September event, Apple unveiled 2018 iPhones, Apple Watch Series 4, and talked about the iOS 12 and watchOS 5. People were expecting that the company will talk about the products like the AirPower Mat, AirPods, and new iPads. When it didn’t happen, tech journalists stormed the internet with articles criticizing Apple for its silence. Some publications even labeled the whole event as boring and disappointing. It’s funny, isn’t it? Apple is one of the most valued company in the world and it is known for keeping its plans secrets. Calling them a liar or cheaters is inappropriate and is not helpful to the tech industry as a whole. Expecting a product launch is something different but adding voice to the critics is the dumbest thing we have ever seen in this industry. People are spending so much of their time getting angry about Apple’s AirPower Mat clearly means that they do not understand what they are expecting. Wireless charging technology is challenging to deal with. It looks easy and very simple on papers. People who spent little or more time reading spec sheets and Apple’s AirPower Mat’s patient details are the ones who are arguing the most because according to them, making a wireless charging solution is as easy as making a Raspberry Pi project. Apple AirPower Mat will be capable of charging up to three devices at once. The company will keep the Qi charging standard but it will also build three charging sensors inside the Mat. Each of them will be controlled by Apple’s own chip which will reportedly run on a lightweight version of iOS. If you’ve observed, Apple has already changed the design strategy for its iPhone. The material on the back of these new phones is efficient for wireless charging. On the Watch Series 4, the company has used a combination of ceramic and sapphire crystals. The watch sports electrodes on its back to achieve better radio wave exchange. Currently, the 2018 iPhones and their predecessors support the quick charge. Apple showed off Mophie and Belkin charging base during the iPhone X launch event and also confirmed that it will launch its own AirPower Mat in 2018. If you have used these charging pads, you may have noticed that these bases don’t work efficiently in terms of fast charging. Apple’s quick charge is far better and all the other solutions, no matter if it’s Qi charging base from Mophie or Belkin, they all are slow. 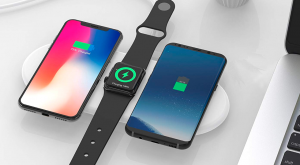 Demand for fast charging is on the rise and if Apple is considering AirPower Mat, the company will most likely bring a solution that charges your devices faster. To achieve that level in wireless technology, the company must address the challenges and overcome the hurdles they are facing in terms of the development of their product. At the end of the day, as tech enthusiasts, we expect Apple to bring something more meaningful. Something which is far better than the third-party products available in the market. And if Apple needs some more time to launch the AirPower Mat then it should take the time. People need to understand that the delay is for their good only and even if Apple has messed up the project, as this is being said by many tech journalists, let them mess up, rework on things and come up with something truly revolutionary.